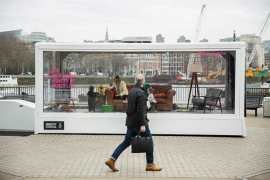 Amnesty International staged a living installation over Mother’s Day weekend to highlight the importance of reuniting refugee families and to gather support for a vote in Parliament on the Refugee Family Reunion Bill. Real families spent time in the large perspex box on London’s South Bank, where the public could observe them sharing the everyday joys of family life such as playing games, eating a takeaway and watching TV. On the Saturday before Mother’s Day we live streamed two broadcasts from the box onto the Amnesty UK Facebook page capturing the activity of the families and the reactions of passersby. The two four hour streams were viewed by c. 100,000 people. The post itself had a simple call to action which allowed viewers to easily contact their MP to encourage them to attend Parliament and vote for the bill. Overall the campaign generated over 15,000 emails to MPs and the bill was passed in Parliament in March 2018.